This thinking comes directly from Lexus itself. Lexus is fully aware that its current sedan lineup needs improvement. According to Automotive News, Toyota’s luxury brand has been paying close attention to the huge crossover demand lately, which is all fine and good, but it’s coming at the expense of sedan sales. For Lexus, sedans, such as the LS, was once the core of its very being, and it must respond to the crossover surge by making future sedans relevant once again. Fortunately, its global branding chief, Tokuo Fukuichi, has already come up with two things needed for that sedan comeback. First off, as crossovers have come to handle more like regular cars as opposed to SUVs, Lexus' "sedans need to deliver even better driving dynamics." 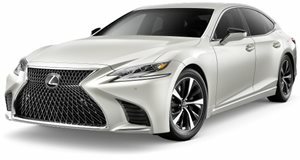 Second, as premium buyers’ tastes become more casual, future Lexus sedans need to "lighten up," so to speak, and become less formal. Heck, Fukuichi isn’t even ruling out a potential Lexus station wagon. "Unless we can really offer a sedan experience you cannot have with an SUV or crossover, I think the sedan may not be able to survive if it does not evolve," Fukuichi told AN. "At a certain point of time, the traditional, square, three-box sedan will go away." In other words, crossovers are currently and will continue to be more appealing than sedans to customers because they offer more space, a higher driving position and they’re now just as comfortable, if not more so, than sedans. Lexus feels that its future sedans can counter this trend with, for example, lower centers of gravity for better handling, improved steering response, and an overall shift away from being the so-called "old man’s car." Think more along the lines of the Porsche Panamera. Lexus has already begun this change with its new and far sleeker LS flagship sedan. And as for that potential station wagon, "if we’re going to do it, it can’t be just an ordinary station wagon," Fukuichi declared.